I don’t know if y’all remember but at one point I started a Xiang Chinese embroidery kit. I really felt like working on that style of project, but that one just seemed so very large and such a long way from finished! So, well, I started a smaller one! This one I am using both strands of silk rather than dividing it up. I will go back to the other one, I swear! But it sure is nice to make a lot of visible progress. See, I finished the branches and started on the leaves already! 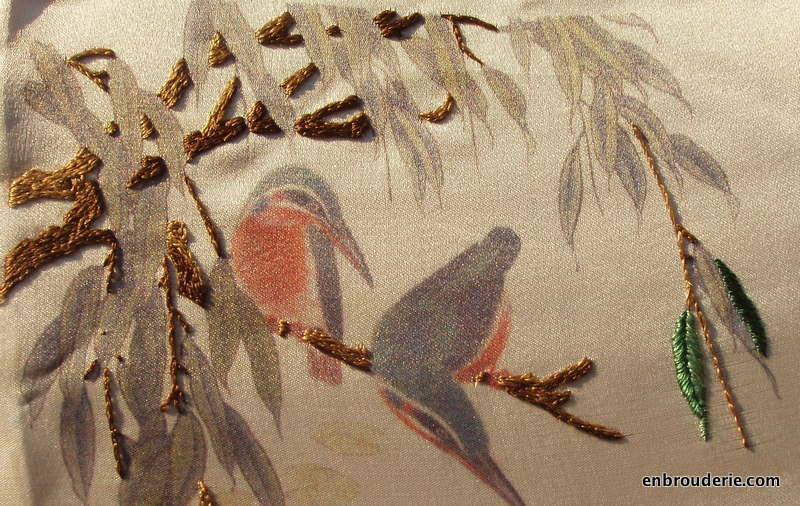 I opted for split stitch on the branches – I have no idea if that’s what Chinese embroiderers would use. Here is a closer view. I don’t know if you can tell, but the fabric is developing some lines in places near my stitching. I don’t think I’m pulling my stitches that tight. I’m not sure what’s wrong. Now, if you want to see something really wrong, check out my first attempt at using stretcher bars! Perhaps I should spend more than $3, read up on how to do it, and also improve my thumbtack methodology before the next project. However, this one is more or less stuck to the frame so it is staying right there until it’s done. I hope. I really need to work on having some patience when setting up projects. 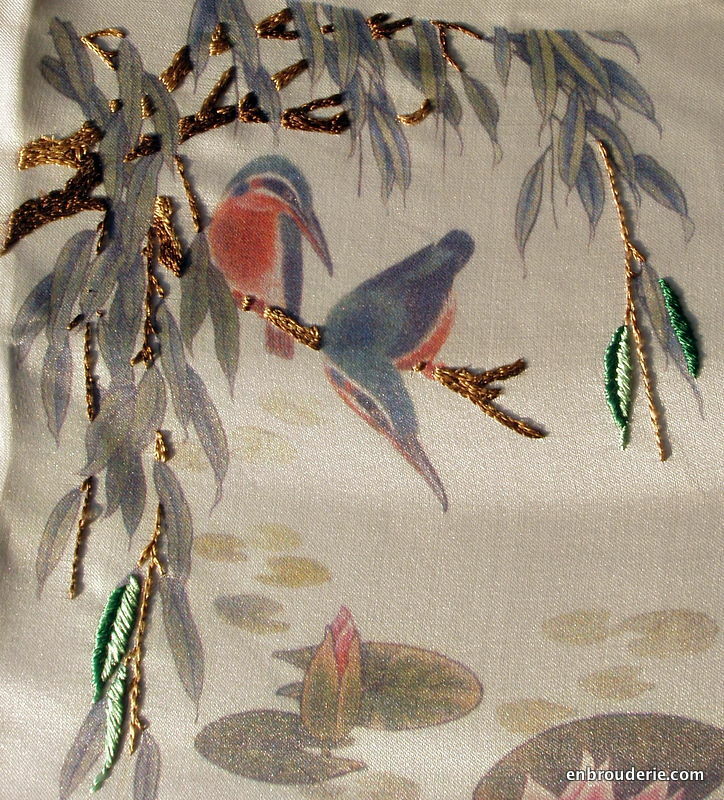 By the way, I went back to the Elite Silk Arts website (where I got it) and they’ve been making some changes! They now have some video lessons for sale. I have no idea how good they are, but perhaps I will check it out at some point. Has anyone tried it? It also says they’ll be starting online classes sometime this year. 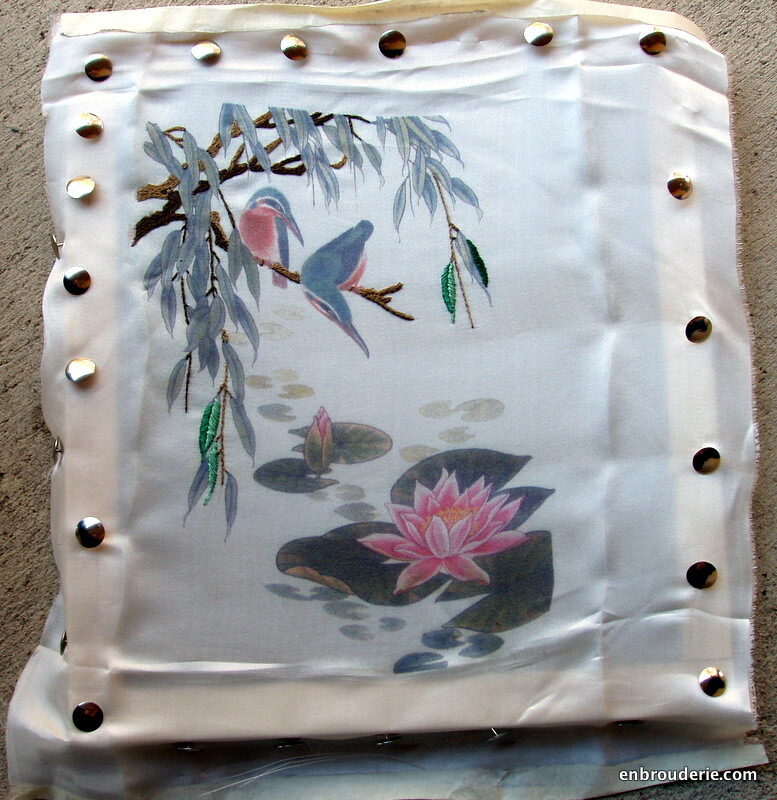 This entry was posted in My work and tagged Chinese embroidery, embroidery, xiang silk embroidery. Bookmark the permalink. Snap, tear some strips of muslin about 3″ wide and clamp them in with the fabric. Then you will have an even tension across the whole piece and that will be much easier to work with. Aha. Perhaps that is what is going on there. I don’t have a QSnap small enough at the moment, and I was impatient to get started. Perhaps it would be worthwile to acquire one. 😀 Learn something new every day! I think your fabric is not drum tight.This may also be one of the reasons for the bubble.I always fix up one side first,then go to the opposite side and stretch it,then stretch the other two sides.It works out for me.Did you stretch like this?.Put the pins at the side of the bar,so that it’ll not distract us while we stitch.I agree with you,we live to learn,aren’t we? You need to use many more pins, placed much closer together. I have some special three-legged pins like the ones silk painters use. So many helpful commenters! Hurray! I couldn’t get the sample videos working either. I have corresponded with them before by email, and they are quite friendly. I think maybe they are in the middle of updating their website? Also, keep in mind the time difference to California! Oh my another website to drool over! I agree about the tight frame – you could use stretcher bars if you sewed extra fabric around the edges then pinned, pinned, pinned. I have never done a practice piece in my life. I learn on projects that interest me. Yes, if I am not fascinated by a design, then it is never going to happen.